This year’s edition of the Premier’s Cup was launched at Coastlands Hotel by the Ridge in Durban last week Friday. 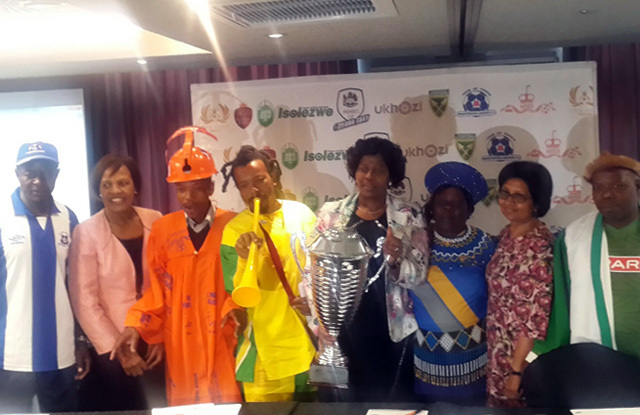 The MEC for Sports and Recreation Bongi Sithole-Moloi officially launched the annual event which was attended by players and supporters from the four NFD and Two PSL teams that will participate in this tournament, of which Maritzburg United are the defending Champions after beating Lamontville Golden Arrows 2-1 the previous year. This year’s event sees an addition of one more team after King’s United was promoted into the NFD ranks last season. Altogether six teams will be taking part this year, namely Maritzburg United, Lamontville Golden Arrows, Royal Eagles, AmaZulu, Thanda Royal Zulu and King’s United. The games will be played at Mhlathuze Sports Complex on the 13th and the 14th of August 2016. The teams will be involved in a CSI on Friday the 12th in Richards Bay, and the tournament kicks off the next day, with the NFD teams involved in play-offs to qualify for the semi-finals on Sunday. At 11am on Saturday, Royal Eagles take on Kings United. Thanda Royal Zulu and AmaZulu then follow at 1.30pm. The first semi-final on Sunday will be at 9am where Maritzburg United will face the winners of the second play-off (Thanda/ AmaZulu). At 11.30am, Arrows face the winners of the first play-off (Eagles/ Kings)..
Finals will be played at 3pm. In all the games, in an event of a draw, they will go straight to penalties. Fans are encouraged to support this event by attending and to rally behind their respective teams as we prepare for the start of the new season on the 23rd of August.